Charles Jennings | Workplace Performance: It’s Only 65% ! The results of yet another 70:20:10 survey were published recently. The researchers (possibly on work experience) declared that “50:26:24 is the average learning mix in most companies right now”. A few things flew off the page from this survey and hit me square in the temple. The comments below are not intended as a blanket criticism of this specific survey, but it did get me thinking about a number of misconceptions of what the 70:20:10 model is really about. It also got me thinking about approaches to organisational learning in general. Although the terms convey basic concepts, there seems still to be some confusion between the meaning of the words learning and training. This confusion is not isolated in surveys such as the above. It is a common problem and underlies many of the barriers that organisations encounter as they strive to develop and implement effective learning strategies. ‘Learning’ covers a much wider range of activities than training. Learning is a process not an event. Learning is something we’re doing every day. Training describes a structured set of events that when designed and assembled carefully can provide an effective way to help people accelerate learning (learning = behaviour change). However the words training and learning are not interchangeable. “.. the unofficial, unscheduled, impromptu way most people learn to do their jobs. Informal learning is like riding a bicycle: the rider chooses the destination and the route. The cyclist can take a detour at a moment’s notice to admire the scenery or help a fellow rider." Jay wrote the seminal book on Informal Learning. The 70:20:10 model is not about percentages or numbers and there is no universal ‘right’ ratio. 70:20:10 is a model that describes the way adults in work generally learn. So why use the numbers, then? The numbers are a useful reminder that the majority of learning occurs through experience and practice within the workflow (the ‘70’), through sharing and supporting others, conversations and networks (the ‘20’), and that a smaller amount of overall learning occurs through structured training and development activities (the ‘10’). 70:20:10 is not a recipe to be used slavishly. The numbers are a simple framework to drive change and help people focus beyond structured learning interventions to where most of the learning happens (in the ‘20’ and ‘70’). I wrote about ‘the numbers’ on this blog back in June 2012. What I said there still holds. Every organisation that uses the 70:20:10 framework will have individual needs and contexts. The way they support learning and development will be particular to them. If you’re in a high compliance environment it’s likely that your people will be required to spend more time on structured training (whether this has an impact or not is another issue altogether). If you’re working in a highly innovative and creative environment it’s likely your learning and development will be skewed more towards the social and experiential types of development. So the ratios describing how people learn in a large compliance-driven organisation are likely to be different from an agile start-up. How we support learning and building high performance should reflect these differences. So if you’re supporting effective learning and development in a high compliance context, then you’ll need to be aware that the ‘best’ ratio for your organisation and the individuals will be skewed by regulatory needs. If you’re supporting effective leaning and development in an environment where agility and innovation are at a premium then you’d better be prepared to support higher levels of collaborative and ‘trial-and-error’ learning – in the ‘70’ and ‘20’ zones. I found this a strange categorisation. Now I’m not sure if I’m over-reacting to this approach, or I simply don’t understand it, but ‘on the job training’ suggests structure and intention to me. The ‘training’ word gives that away. But then the input for this survey asks for the ‘current learning mix’ and offers ‘on the job’, ‘informal’ and ‘formal’. On-the-job learning doesn’t have to be structured and intentional. Most isn’t. I don’t want this post to be a criticism of an individual survey design, but I do think that the designers of data-gathering surveys such as these need to think about the terminology they use carefully. In my mind ‘on-the-job’, ‘informal’ and ‘formal’ are not three mutually exclusive categories. In real life 'on-the-job' learning can be either informal (i.e. self-directed or non-directed) or formal (i.e. experiential development that is part of a structured course or programme). ‘Formal learning’ suggests learning that is designed and directed by someone other than the learner as part of a curriculum, course, programme, module etc. Formal learning can include on-the-job activities and learning, but not necessarily. These three types of learning are not dichotomies (if one can have dichotomous trios). The world is not black-and-white. Without any definitions of these categories (and I couldn't find any in this survey) I fail to see how respondents will provide consistently accurate input. Potentially leading to garbage in, garbage out. The final point I would make is that focusing on ‘the numbers’ masks the fact that learning happens as a continual process and usually as part of the workflow. That’s a fact. We humans are learning machines. We can’t help but learn as we live and work. Even when we engage in classes, programmes and structured eLearning modules as part of the overall mix to support and accelerate learning and performance improvement we don’t stop learning as soon as we walk out the door or finish the online recall test. We continue to learn as we put our new knowledge or skills into practice. We continue to learn as we discuss challenges and options with our colleagues. We continue to learn as we try to do things a newer, better way. 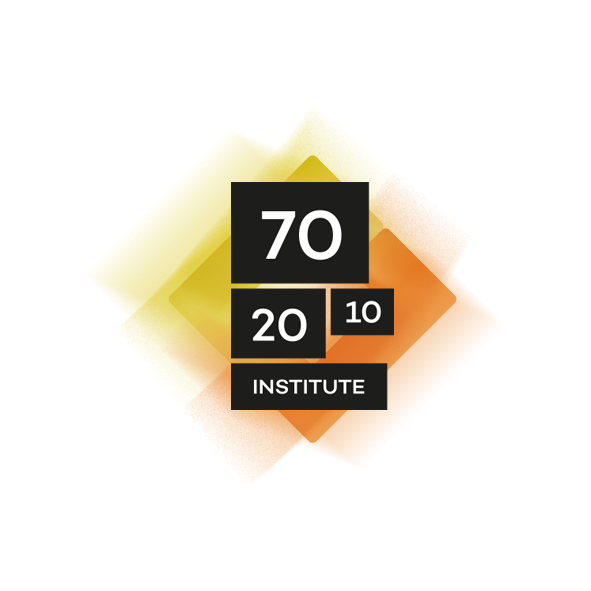 Many organisations are using the 70:20:10 framework to help create cultures of continuous learning and to to build high performance. They understand that more formal learning is not necessarily better, and that by helping develop mindsets to exploit learning and development opportunities whenever and wherever possible they are much more likely to achieve their high performance aims. Images © Adam Weisblatt and © Jim Potts. Not to be reproduced without permission of the copyright owners. Well stated, Charles. Whenever I read the conclusions of just about any survey, I'm reminded of the landmark study that Dr. John Ioannidis, an epidemiologist at Stanford University, published in the Journal of the American Medical Association in 2005 regarding published medical research, "Why Most Published Research Findings Are False." The title is self-explanatory, and we're talking well-funded, ostensibly carefully constructed research here. If you extend Dr. Ioannidis' conclusions to a self-styled, uncontrolled, voluntary online survey . . . well, let's just say I wouldn't take the "50:26:24" results too seriously. All make for enlightening reading. Good of you to point out the confusion in industries between 'training' and 'learning', and the fact that the term 'on the job training' is used here. It would be interesting to know if really, that's the bit where people are just left to it, particularly if organisations see formal learning as something other to 'on the job' and informal learning as 'coaching, asking peers questions, etc', and also different to pure 'on the job' (whatever that means). I think the 70:20:10 is a useful matrix to encourage blends and moves away from death by courses, but really, as L&D professionals, we know that separating out 'informal'; 'formal' and 'on the job' is a bit of misleading and potentially unhelpful design-tack, as it can prevent a more holistic and realistic view of how learning happens. I do shudder when I hear people talking about the 'most effective blend' for learning, or any words to that effect. But then, people like certainty and numbers, so perhaps this is the attraction. In my recent book on 'Informal learning at Work', I mentioned 70:20:10 and said "Of course it must be remembered that 70:20:10 is not a recipe or a ratio to aspire to. It is a lens through which we can look at organizational learning in a different way. It helps us focus on the huge proportion of learning that happens informally. In reality, the ratio will vary, depending on industry and on the experience of the learner." The main problem with the numbers is that is so difficult to actually label a lot of the learning as 70, or 20 or 10. There is always a messy mix of learning, and that is OK. For example, on a training course, there is certainly some 10 stuff if the trainer is doing their job, but also there is 20 stuff and 70 stuff going on at the same time. Did you learn something from this excellent blog post by Charles? If so, is it 20, or 10, or 70? If you then discuss this blog with a colleague, what then? If you discuss this in a classroom training about learning design, what then? I also often challenge people about when they are learning. A huge amount of informal learning happens outside of conscious awareness. It is a side effect of activity. That is we are unaware that we just learnt something, so when asked in a survey where we learn stuff, we cannot possible give 'correct' answers. Here's a challenge for you... For a 30 minute period, write a note of everything you learn. And I mean everything. I bet you can't do it. I bet your list is not complete. I couldn't agree with you more. What's even more frustrating is to see organizations adopting this as a rule (instead of guideline) within business decisions. For example, "We only have 10% of the budget that can be allocated for formal training"... crazy. Learning is not an event, it's a process. Great stuff as usual, thanks for posting!